Tae Kwon Do is a new Olympic sport and martial art of Korea . Tae Kwon Do is the most popular of the Korean martial arts and is the Korean national sport. It is also one of the world's most commonly practiced martial arts. In Korean, derived from hanja, Tae means "to kick or destroy with the foot"; Kwon means "to punch with the fist"; and Do means "way" or "art". Hence, TKD is loosely translated as "the art of kicking and punching" or "the way of the foot and the fist." TKD is a combination of combat technique, self-defense, sport, exercise, entertainment, and philosophy. The art in general emphasizes kicks thrown from a mobile stance, using the leg's greater reach and power to disable the opponent from a distance. In sparring, roundhouse, front, axe, and side kicks are most often used; advanced kicks include jump, spin, skip, and drop kicks, often in combination. TKD training also includes a comprehensive system of hand strikes and blocks, but generally does not emphasize grappling. TKD is one of two Asian martial arts to make it to the Olympic Games. There are four basic elements in Tae Kwon Do: Form, self defense, breaking techniques and sparring. All students will receive instruction in these four elements. Advanced students will receive training in the use of traditional martial arts weapons. Muay Thai is a traditional art of self defense which has been handed down through generations for over 2000 years. Today, Muay Thai is the national sport of Thailand and the most influential style in international kick boxing. Often referred to as "The Science of Eight Limbs", Muay Thai employs techniques with the hands, feet, elbows, and knees extensively. Unlike many other martial arts, Muay Thai is specifically designed to promote that level of fitness and toughness required for ring competition. Training regimens include many staples of combat sport conditioning such as running, shadowboxing, rope jumping, body weight resistance exercises, medicine ball exercises, abdominal exercises. Training that is specific to a Muay Thai fighter includes training with coaches on Thai pads, focus mitts, heavy bag, and sparring. The daily training includes many rounds (3-5 minute periods broken up by a short rest, often 1-2 minutes) of these various methods of practice. Thai pad training is a cornerstone of Muay Thai conditioning which involves practicing punches, kicks, knees, and elbow strikes with a trainer wearing thick pads which cover the forearms and hands. These special pads are used to absorb the impact of the fighter’s strikes, and allow the fighter to react to the attacks of the pad holder. It is an exhilarating and comprehensive work out. What are the benefits of studying martial arts at Black Belt USA? Regardless of your age or skill level, you can expect to recognize many benefits from Tae Kwon Do & Muay Thai. The most obvious benefits are increased strength, power and stamina, increased flexibility, improved reflexes and coordination and better cardiovascular fitness. Other benefits include enhanced concentration, focus, and self-control, as well as improved self-confidence and stress reduction. What are the Tae Kwon Do Belt Colors? The time it takes to become a proficient in Tae Kwon Do varies with each student depending on the students' skill and commitment. In general, a student can expect to achieve the rank of 1 st Degree Black Belt in about 3 years. What is the ranking system for Muay Thai? There are no belt rankings in the Muay Thai system. However, under the Thai Boxing Association of USA there are three levels for student to achieve. Level one, level two and instructor level. Each level takes 1 to two years of training to achieve. However, there are preliminary tests every 3 to 4 months between each levels. How is your school different from other schools? 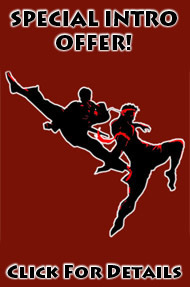 While most schools focus on only teaching the techniques of Martial Arts, "Black Belt USA " concentrates on the attitude skills of the Martial Arts as well. Of course, our students do develop exceptional skill in all areas of technique. More importantly, though, they develop important skills that they can put to use outside of the martial arts school. Skills like: Self-Confidence, Self-Control, and Positive Thinking; Listening Skills, Respect and Good Manners. The Ability to Focus Attention; Perseverance and Courage. Additionally, ours is a "friendship" based teaching system. Our teachers are truly wonderful people. Of course, you are invited to stop in and meet them, anytime! Our youngest student is 5. Our oldest students are 60+. Will martial arts make my children more violent? Martial Arts can make a child more prone to violence...when it is taught by hard-core, aggressive teachers. The "Black Belt USA " teachers, however, are gentle and caring individuals. Through their example, our students learn to live peacefully with others! Your safety is our primary concern. While we encourage our students to reach their maximum levels of physical and mental fitness, we will never require a student to do something for which we do not believe that student is capable or ready. We always encourage our students to express any concern they may have about any moves, exercise or classes. Your safety is of utmost importance in ensuring you achieve your goals in Martial Arts. How do I know if Martial Arts are right for me? First, call and set up a time to watch a class session. During this visit, you will meet Master King. He will discuss your goals with you, and answer all of your specific questions about "Black Belt USA " If you like what you see and hear, he will show you how you can try our Introductory Program. This program gives you an opportunity to work individually with one of the teachers. 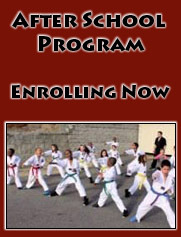 The Introductory Program would give you a clear sense of whether or not the Martial Arts are right for you! How many classes per week should I attend? Three classes per week is the ideal. Two classes is minimum requirement, but depending on the program, you may be able to attend as many classes, as you like. You should match your involvement with your fitness level. Will martial arts training makes my child too aggressive? At Black Belt USA , children learn that the martial art is not an act of violence, but the art of how to handle themselves in a problematic situation. Aggressive behavior is channeled into assertiveness to increase a child's self-esteem and build discipline and character. Why should kids study at Black Belt USA? For people new to the martial arts, the benefits of martial arts training might not be obvious. Some will think, sure, it's a great workout--just look at that "Tae Bo" guy. And of course it's good for self-defense, with all that punching and kicking. But the benefits of martial arts training, especially for children and teenagers , are much more than simple physical improvements. Martial arts benefits span a spectrum of physical, mental, and social attributes, all of which are learned and improved through martial arts training. Naturally, these benefits also apply to most adults as well. However, developing these attributes early in life contributes to a healthy, happy adulthood. That's why it's even more important to get the kids kicking. At Black Belt USA, you can train in authentic Muay Thai and Tae Kwon Do. Located in Charlotte, NC.